There's something about unseasonably spring-like weather that causes me to revert back to my hopelessly romantic teenage self. It's been a while since I wrote about anything from Teacuppa! Look past their goofy name and you'll find that these folks have many lovely teas available, particularly their Wuyi yancha. This Rou Gui does not disappoint. 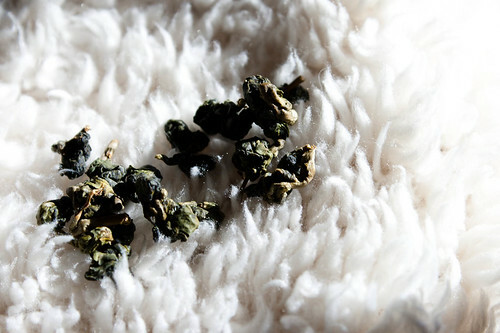 The dry leaf has quite a range of brown tones thanks to its lighter firing, making it a pleasant tea to look at. Chocolate, caramel, and cinnamon are all clearly present in the dry leaf aroma. 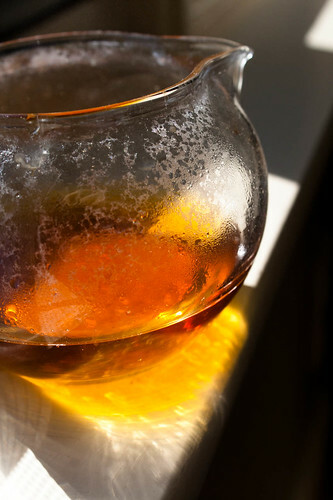 The brew itself tastes of caramel and spice, but more remarkably its texture is smooth (especially for such a young tea) and oily, coating the lips and mouth long after it is reluctantly swallowed. It isn't too heavily fired, so its aromas and flavors are more rounded-off, and less harsh or edgy than high-roast teas. This can be a good or bad thing depending on what you're looking for— this isn't a terribly complex, floral, or fruity tea— but I think the velvety texture is worth the trade-offs. One thing about Teacuppa's yancha is they are almost all light-to-medium roast with a smooth, coating mouthfeel— so if you enjoy that style as I do, be confident and sample ferociously.